This year’s The Eighth Doctor: The Time War box set sees the injection of some new writing talent into the Eighth Doctor. It’s the first Eighth Doctor box set to not solely be written by John Dorney and Matt Fitton since 2016’s Doom Coalition 2. Since then, we’ve had a full four box sets written solely by those two men; if you go back to 2014’s Dark Eyes 2, they account for 30 of the last 34 Paul McGann episodes between them. Doctor Who almost always benefits from new voices, so I was quite excited that The Eighth Doctor: The Time War 2 was written by Jonathan Morris, Guy Adams, and Timothy X. Atack. Morris last wrote for McGann eight years ago, with The Resurrection of Mars, while Adams and Atack have never done so. I would argue that the infusion of new writing talent could only help a range that has started to feel a bit tired (neither The Time War 1 nor Ravenous 1 really impressed). That said, listening to the CD extras, it struck me that when the writers describe their ideas, almost all of the box’s episodes sounds more exciting than they actually came out. The release begins with The Lords of Terror, and Morris indicates that he was keen to explore the ambiguities of the Time War, the way in which the Doctor’s people might be even worse than the Daleks, and how that might challenge his morality and decision-making processes. But in listening to the story, this element feels underplayed, as there’s never much of a dilemma for the Doctor. It’s also worth pointing out that this idea has been explored a lot already; the Sixth Doctor on television complained his people were worse than the Daleks in The Trial of a Time Lord, and on audio, the Eighth Doctor has confronted the immorality of his people in Neverland, Zagreus, Human Resources, Dark Eyes, and Doom Coalition, among many others. The story also promises that we will learn more about new companion Bliss, played by Rakhee Thakrar; it takes place on her home planet, which has fallen sway to a tyrannical regime. Unfortunately, the story makes little of this as well, with Bliss falling in with a group of rebels and just doing all the usual things a companion does in this kind of circumstance. Her emotional reactions to the transformation of her planet are inadequately explored, possibly because they’re kept too abstract: she sees where her house was, but doesn’t meet any familiar faces from her old life on the planet. On the other hand, Planet of the Ogrons is a more successful story. Guy Adams’s script combines two batty, out-there ideas: that the Eleven of Doom Coalition and Ravenous fame has regenerated into the Twelve, who has the form of a cardigan-wearing grandmother, and that the Doctor in his future may regenerate into an Ogron of Day of the Daleks and Frontier in Space fame. I don’t think it’s quite as amusing as it ought to be, and the plot is too simple, but it’s an enjoyable story with both some great comic moments (especially the last scene featuring “Doctor Ogron”) and some audacious ideas (Adams establishes that some Doctor Who TV stories as we saw them are the result of Time War interference). Julia McKenzie is, in particular, a delight as the Twelve, picking up the torch from Mark Bonnar (more on that later), and Jon Culshaw is good fun as Doctor Ogron. In the Garden of Death is another of those stories that sounds better described than in practice. The Eighth Doctor has once again lost his memory, placed in a prison where no-one knows who they are. (Which I seem to recall also happened to him in Something Inside.) Because of the extra security he’s subjected to, the Doctor concludes he might be the most dangerous criminal of them all. I like this hook… but nothing is ever done with it. The Doctor never modifies his behaviour because of it — it seems like a neat twist would be that he refuses to escape or something, but the story proceeds not too differently from how one would imagine it would go if he did remember who he was. The real highlight of the story is McKenzie’s Twelve, as this is the story where the contrast between her grandmotherly charm and violent past is played up the most, as she works to escape from the Dalek prison in her own way, giving her a number of really effective, sometimes chilling, scenes. The last story in the set is Timothy X. Atack’s Jonah, and it’s probably the best Eighth Doctor story we’ve heard since Absent Friends or Ship in a Bottle. It’s interesting, because on paper, it probably sounds the least interesting: the Doctor versus Daleks in submarines, yet another example of crudely porting World War II tropes over into the Time War. Yet it really works, mostly because of the details. The Doctor’s delight in being nicknamed “Jonah” by his crew, for example, or the suspense that comes from everyone having to run silent, or the fact that the crews of these submarines feel like real people even though we’ve only just met them. The little nuances that make a good story great are all here. And unlike in the other stories in the set, the Doctor’s morality really is tested by its events. Anya Chalotra, Tania Rodrigues, and Surinder Duhra all really impress in their roles (Rodrigues even has something interesting to say about her characterisation in the extras! ), and Bliss feels more like a real human being than in the previous seven stories put together, just through the little details of the writing. McKenzie puts in another strong performance as the Twelve, and Cardinal Ollistra is back. Sometimes Big Finish make her a little too cosy compared to her debut in Only the Monstrous, but this story calibrates her ruthlessness and disdain rather well; she is not and ought never be a friend of the Doctor’s. Jacqueline Pearce is always at her best when disdainful; her diary entries are an especial delight. Benji Clifford does a good job on sound design throughout, but Jonah gives him more to play with than another Dalek runaround. Timothy Atack doesn’t actually appear on the extras, but when producer David Richardson and director Ken Bentley talk about what a departure his script is in having a less action/adventure, more intimate approach to the Time War… it just makes me wonder why all Big Finish’s writers aren’t playing more to the strengths of audio all the time. The Time War 2 is a more ambitious approach to the Time War than we heard in The Time War 1, with more to do for Paul McGann, and hopefully stories like Jonah mark the way forward for subsequent sets. 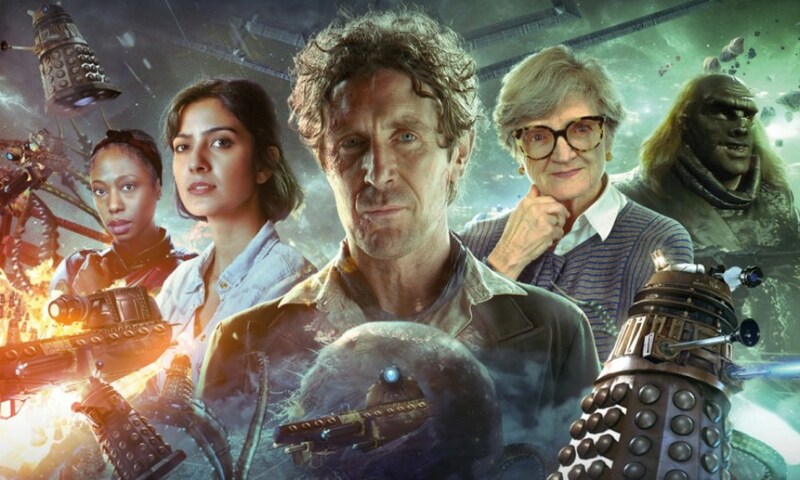 The Eighth Doctor: The Time War 2 (by Jonathan Morris, Guy Adams, Timothy X. Atack; starring Paul McGann, Rakhee Thakrar) was released by Big Finish Productions in July 2018.